I am a high school teacher who has been teaching ELL for many years now. 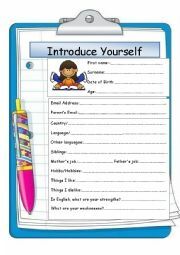 First day of class worksheet for students to introduce themselves. This is a group project that allows students to work on the computer and in the classroom. It involves written, drawings, and speaking activities. Thanks PhilipR for the use of your template. 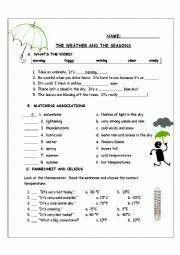 A worksheet to help students learn the vocabulary for the weather. 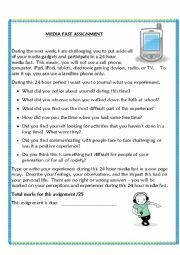 Here is an assignment to challenge your students to put away their media devices for one day and write about their experiences. It is a good follow up activity after learning about various media devices and perhaps teen or adult addictions to these devices. 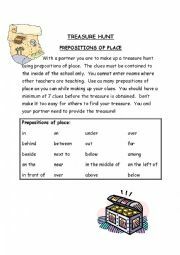 Here�s an active writing activity to help students practice using Prepositions of time. Not only do they practice writing using the prepositions but also have to read and understand the clues of other students. This is a good activity to discuss dreams and what your dreams mean. Students write down every morning for a week what their dreams were about. Then they try to look at a pattern. 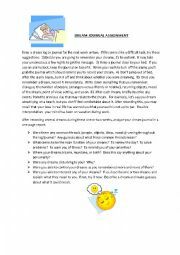 After students complete this activity the class can then look at what certain dreams could mean. 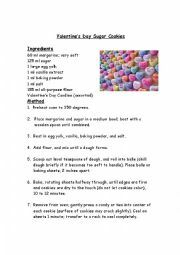 If you are looking for an activity to do with your class for Valentine�s Day, here is a great recipe. It is designed for 2 students. Or you can make up a large batch of the dough and have the students roll out the cookies and bake them. The second day, they can decorate the cookies. 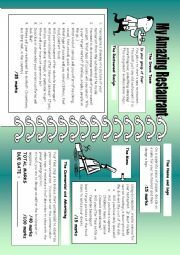 Pizza recipe to make in groups of 2 or 4 in your class. 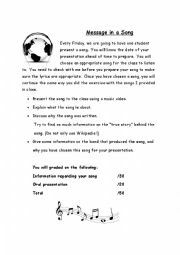 Students love music and this is their opportunity to find a song they truly love and present it to the class. It also gives teachers a good opportunity to assess their oral language. This is a good introduction to talking about nutrition in your classroom. 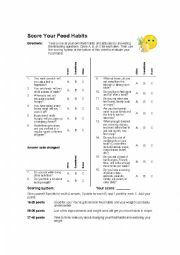 Have students complete the test and then lead into your lesson about nutrition or food.